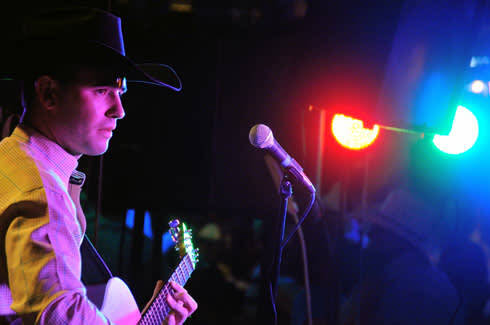 Young country traditionalist Will Banister wows ’em from Portales to Piccadilly. Wednesday and Friday nights, Kelly’s Bar & Grill, on bustling Prince Street, in Clovis, transforms into an old-time honky-tonk. As the dancing hour approaches, Adam, the doorman, sprinkles handfuls of cornmeal across the empty wood floor and the crowd bolts down the last forkfuls of dinner needed to fuel hours of two-stepping. At exactly seven o’clock, the band strikes up a chestnut, Merle Haggard’s “Tonight the Bottle Let Me Down,” and up to a dozen couples have begun circling the dance floor even before the singer reaches the first chorus. The hour-long first set swings through classics by Hank Williams, George Jones, and Freddy Fender, and whenever the 6’ 2” singer in the black Dusty Rhodes cowboy hat tosses in one of his own songs, it sounds like a direct dispatch from country music’s golden years. Will Banister, though, is no septuagenarian crooner giving the honky-tonk circuit one last whirl. The 24-year-old from Portales has become one of country music’s rising young stars since the release two years ago of his debut album, Turned Her on to Country. A triumphant six-song set last February at the International Festival of Country Music, at London’s Wembley Arena, prompted a Daily Telegraph review that noted “the most memorable moment found . . . Will Banister wowing the crowd with a sublimely straightforward, ‘Lovesick Blues.’” His Wembley success launched him into that market: He now has three tours in the country-music–crazed UK inked on his calendar. “I’ve got videos of me wearing diapers singing ‘Your Cheatin’ Heart,’” he says over enchiladas at Leal’s restaurant the day before his regular Wednesday-night gig at Kelly’s. “My grandpa would always get me to sing that one for him. My dad was always singing to us. He’s the one who got me turned on to old country. Banister’s voice, though, didn’t join the team until his freshman year at Portales High School. “My voice was kinda girly when I was 11,” he admits. “It was changing when I started high school. In a school talent show, I tried singing high like I’d always done and my voice cracked real bad.” But it turned out well. The singer of classic country songs emerged with a classic country voice, deep and resonant, with obvious similarities to those of Merle Haggard and George Strait. If the music sounds too good to be true for such a young bandleader, credit lead guitarist Johnny Mulhair, who produced and accompanied LeAnn Rimes until her career skyrocketed with the release of her multi-million-selling 1996 album, Blue. After 11-year-old Will Banister recorded some Hank Williams and Lefty Frizzell songs at his studio, Mulhair was impressed enough to stay in touch and nurture the young man’s career as he became serious about music. The Mulhair home and adjacent recording studio, just up the street from Kelly’s, became Banister’s home away from home. Johnny and Jill Mulhair met at Clovis High School in 1970, and they’ve been making music together ever since. With Johnny on lead guitar, Jill now sings harmonies and plays electric bass in Banister’s band. Five years ago, Banister not only met his future wife and muse, but—perhaps not coincidentally—also began to write his own songs. Two years later, at 21, Banister released his debut album, Turned Her On to Country, with 11 songs that could have come from the George Strait songbook. You can find Tessa in most of them. He admits that he hasn’t suffered the heartache that seems requisite for a career as a honky-tonk singer. But every time Tessa takes their baby girl, Kylee, home to visit the grandparents in Santa Fe, Will finds a way to squeeze a heartbreak song out of it—including one, “I Hate Santa Fe,” that’s more a lament about missing his wife and daughter than it is grounded in any animosity toward the City Different. Writer/photographer/singer-songwriter Tim Keller lives in Des Moines, near Ratón.